If you’ve taken one of his classes or simply set foot inside Castle in the Air, you know the work of John McRae. Whether he’s demonstrating decorative techniques to students or transforming our front window displays, John is a veritable magician when it comes to conjuring exquisite wonders out of simple materials. This month we’re thrilled to unveil what may be John’s greatest creation yet: a collection of more than 30 pieces of handcrafted jewelry that rival any fabled treasure hoard. 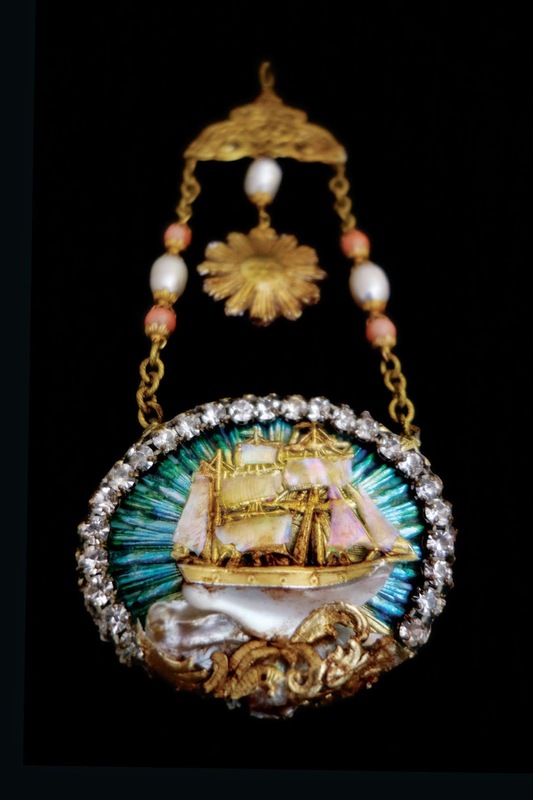 These are John’s “Jewels of Dresden,” wearable art that combines gemstones and other precious objects with the exquisite Victorian crafting material known as Dresden trim. Castle in the Air invites you to join us for the unveiling of the entire collection these highly desirable pieces. Set amidst Castle in the Air’s pre-holiday transformation into a Venetian fantasyland complete with Carnival costumes, this one-of-a-kind exhibit will truly be the jewel in the crown. We’ve held off on pre-selling pieces to share them with you all at once, but the night of the show all of these incredible pieces will be available for purchase. Event guests will enjoy food, beverages, and a souvenir catalog. Read more about John McRae on our blog. Further afield? Join in the reverie on Instagram.